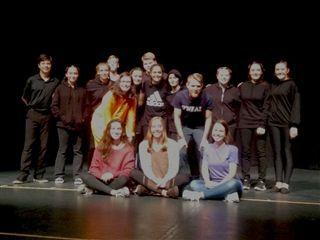 The O’Neal One Act Players received the spirit award at the One Act Festival held October 26-27 at Pinecrest High School. In addition, the team won excellence in lighting effects and Hannah Burns won excellence in stage management. Holloway Jones by Evan Placey was commissioned and produced for the Young People's Programme of Synergy Theater Project. Synergy works towards the rehabilitation and resettlement of prisoners, ex-prisoners, young people, and other at-risk offenders through theater. The play premiered at London's Unicorn Theater in November 2011. Holloway Jones is a coming-of-age tale about a teenage girl in foster care. While the play originally takes place in London between the years 2008-2016, Mr. Placey has given the O'Neal School permission to Americanize the setting and cultural references. Holloway's home situation is in constant flux as she moves from foster home to foster home,—while her Mom is in prison. Holloway picks up BMX racing and is a natural talent. Her major goal is to join the Olympic Development Program so that she can earn a spot on the national team. However, the trajectory of events changes when she meets a cunning and manipulative boy, Avery, who showers her with new and unexpected gifts. Tensions mount when Holloway gets in too deep and must decide between her love for Avery and the sport that can offer her a future on her own terms. The cast of Holloway Jones includes senior Jenna Burns as Holloway, juniors Andrew Lewis and Molly Mansker as Avery and Mom, sophomore Tim Richardson as Coach, and freshmen Ana Huesa as Gem and Isiah Huffman Policeman. Members of the Chorus are all freshmen and they include Meghan Brianas, Kaleigh O'Leary, Piper Everts, Sierra Huffman, Ailish O'Brien, Madelyn Vaswani, and Trixie Gomlak. Mr. Placey's daring play incorporates and juxtaposes dramatic elements from Ancient Greece and contemporary theater. The O'Neal School is very excited to stage the American premiere of Holloway Jones. It will once again be performed on Monday, November 19th at 7pm in the Hannah Center Theater along with the Middle School One Act performance Anxiety is Orange.